Sears has a long history of selling motorcycles, cars and even houses. 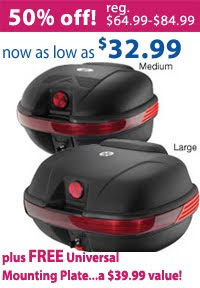 Many of Sears' current motorcycle accessory offerings are lower quality, but it does sell some items from well-known makers, and a few of the Cheapistani products look like they could still be very useful -- such as these Givi-esque top-cases currently 50% off. Don't knock the knock-offs; I used a J.C. Whitney faux Givi top case on my old Yamaha Radian and it worked very well.